I have Welsh ancestry so we’re always happy to do a little crafting around the theme of St. David’s Day which falls on March 1st. St. David’s Day is the national day of Wales and always makes me think of bara brith (fruited bread), teisen bach (Welsh cake), leeks and daffodils. We’ve had bunches of daffodils on our mantlepiece for the last few weeks. They really brighten up the house and are a delicious sign of Spring. 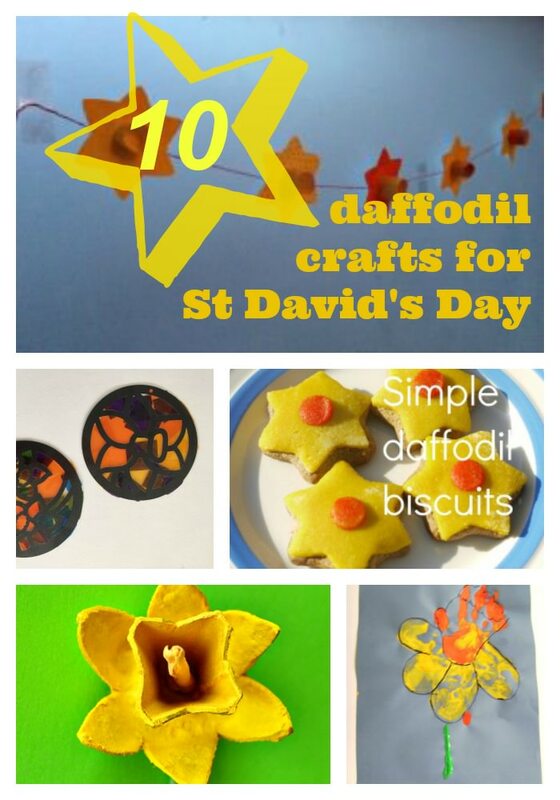 Everyone loves a colourful flower so I have pulled together a list of 10 daffodil crafts for St David’s Day. We love to create sun catchers, these daffodil sun catchers from the gingerbread house and NurtureStore are a fun and colourful activity for kids. You could also string up some homemade daffodil bunting to decorate your living space. You can use all kinds of craft supplies to make your daffodils from craft stick daffodils, egg carton daffodils, paper plate daffodils, pipe cleaner daffodils and even mini cupcake case daffodils. How about using your hands to create these fun handprint daffodils. Bake these easy and colourful daffodil biscuits using ready made icing – a perfect treat after all that crafting! In case you happen to be in or near to Arlington Court, a lovely National Trust property in North Devon, they are running a daffodil trail from 21 March -18 April, including through the school holidays. The trail will showcase the crafted daffodils and also have interesting facts about daffodils along the way. Anyone who donates a daffodil before 18 March will receive a free entry voucher for themselves and friend to visit Arlington Court, valid until 27 March. More information can be found on their website. I love your daffodil activities. Being Welsh myself i love getting a bunch of daffodils in for St David’s Day. It’s cute watching all the children go to school in Welsh Costume too!